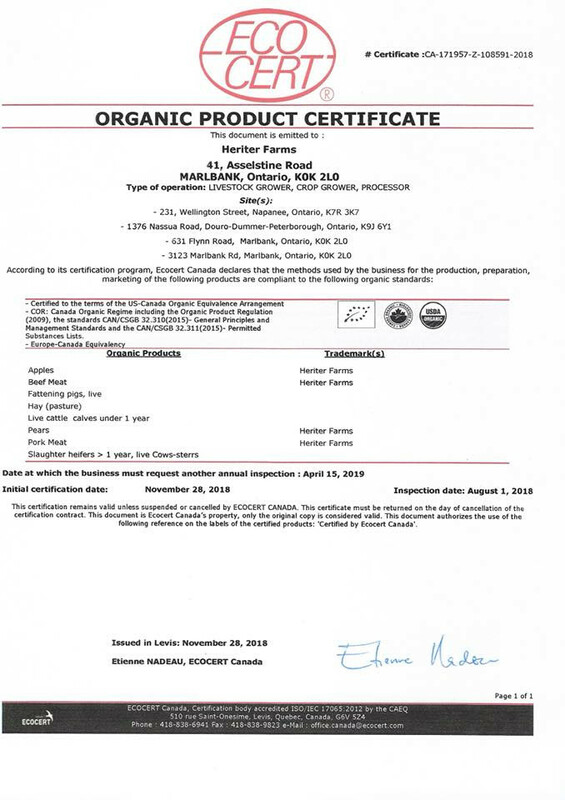 WE ARE PROUD TO ANNOUNCE THAT WE HAVE COMPLETED THE GOVERNMENT-MANDATED TRANSITION PHASE FOR ALL FARMS SEEKING CERTIFICATION AND ARE ARE OFFICIALLY CERTIFIED ORGANIC! The Canadian Organic Standards (COS) mandates that all farms seeking certification, regardless of past farm history and feed usage, must go through a transition period of between 15 - 36 months prior to certification. During this period, all organic guidelines must be followed exclusively, including the feed you use, the livestock care and housing, access to outdoor areas and even the breeding methods. Once the period is over and a thorough inspection and review of records is done, a farm receives it organic certificate for the specific products it applies for. We have satisfied the requirements for certification and are currently approved to offer Grass-Finished Organic Highland Beef, Pastured Heritage Breed Tamworth Pork, Pastured Heritage Poultry and Eggs (summer of 2019 after another inspection to confirm), Cooking and Storing Apples including Crab Apples for Jelly, and our own Organic Hay. STAY TUNED THIS SPRING as we install a 10x20' greenhouse and offer you Certified Organic plant starts as early as May 2019, along with a selection of Certified Organic, FRESH-PICKED VEGGIES throughout the entire growing season to go along with your Heriter Farms BEEF, PORK & POULTRY. We will always start our plants from scratch here at the farm, unlike a majority of greenhouses and your local big box stores who ship in pre-planted vegetables and herbs from Toronto or BC and sell them at jacked up prices, many of which are laced with bee-killing neonicotinoids and are spindly and weak, in the end producing less and being more prone to disease. We will be producing Certified Organic Heirloom Tomatoes, Pickling Cucumbers, and culinary herbs to plant in your own home garden, along with fresh-picked leafy greens, onions and garlic, along with your favorites like tomatoes and squash. We will continue to offer organically-raised "semi-organic" meat for those who don't really care about the stamp of certification or want to purchase cheaper cuts of meat that better suit their budget, because of the limited amount of organic livestock we own, the slow growth rate of heritage breeds, and other important factors. Our herd (fold) is pushing 100+ Highland Cattle and 20+ Tamworth Pigs, however some of these livestock can never be certified because they were purchased from a non-organic farm prior to us owning them 2 years ago, or were calves born on our farm that are not certifiable now because their mothers were not fed organic feed during the last trimester of pregnancy (for more information on the requirements of certification see the COS website HERE). Even though they have been feeding on our own organic pasture & hay, and have been raised under the COS guidelines for the entire time they have been living here (including no antibiotics or hormones/steroids), they will never be approved for organic certification under the COS rules because of their mothers diet. Seems a little silly that a calf born 2 years ago that has been raised organically since being born can never be certified, but the rules are in place for a reason and we take them very, very seriously. For those of you who follow us on FACEBOOK and INSTAGRAM, you know that we have also had a few rough patches with injuries to livestock, like electric fence wire getting wrapped around the leg of a heifer and other similar incidences. Those animals sometimes receive a shot of penicillin to prevent infection and reduce healing time, along with an anti-inflammatory/pain killer called metacam to reduce the swelling and take away any discomfort. As ethical farmers we refuse to let an animal suffer and accept that this sometimes means using traditional veterinary methods to reduce the pain from severe and painful injuries, and to stop the spread of fatal diseases or prevent deadly infections. We always use natural and holistic methods first and will growing our own herbs this year to make tinctures for alternative therapies, but sometimes an injury is too severe or an illness threatens their life and we have to act fast. The COS allows one-time antibiotic use for dairy cows with a 12 month withdrawal period afterwards, but states any use of antibiotics in beef cattle or pigs means they are no longer organic. They do not want an animal to suffer, therefore they allow these medications to be on site, but require detailed records of their use. Any livestock given these medications has been removed from our organic program but are still members of the farm and are just as tender and tasty as any other cut of beef or pork we offer. What it means is that they will not be labelled as certified organic and therefore will be sold as "Semi-Organic" cuts instead. We call it "semi-organic" because they receive the exact same feed and water as our other cattle or pigs, and we wait well beyond the required 30 day withdrawal times listed on the bottle, but even though a cattle received a shot of penicillin 2 years ago, it will never be labelled and sold as organic under the COS rules. We can assure you that the animals that receive antibiotics are tracked carefully and are most often harvested for ourselves. Sometimes an animal simply must be given antibiotics to save its life. Therefore, we do have what is called "conventional" or "uncertifiable" livestock on the property, but they are raised on organic grass and hay, and are treated the same as all the other cattle and pigs. The meat is still organically produced, tastes the same and has been given the necessary withdrawal periods to make the meat safe for consumption, but in order to control the herd, prevent disease from spreading and save the lives of animals, we must do what is necessary to keep this farm and its animals safe. 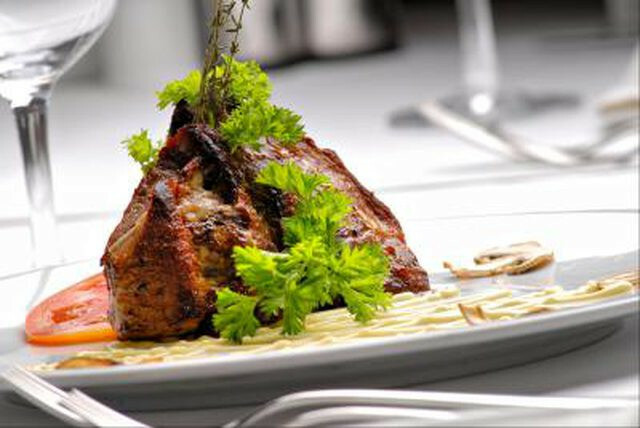 We will therefore be offering semi-organic meat from animals we cannot certify for the reasons above. We will always be honest about what we do, and you can ask to see our records at any time to confirm what we say is true. Come to the farm for a tour with your family and see for yourself how we pledge to keep your meat clean and healthy, by producing Sustainable Foods Today, for a Better Land Tomorrow. Stay tuned for the announcement of our grand opening celebration! We will be showcasing our farm, doing barn and field tours, offering free samples of our organic pork and beef, and giving away great prizes too! Bring the whole family for a day of fun and education! 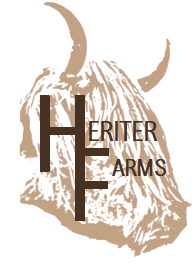 Thank you for choosing Heriter Farms!